Mangalica Pigs (sometimes spelled Mangalitsa (USA) or Mangalitza (UK)) is a Hungarian breed of pig that was developed in the 19th century by cross-breeding the traditional Hungarian Bakonyi and Szalontai breeds with imported Sumadia pigs from Serbia. 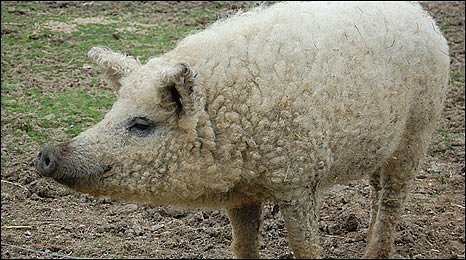 Mangalitsa pigs have a thick hairy coat similar to that of a sheep. The only other pig breed noted for having a long coat is the extinct Lincolnshire Curly Coat of England. The Mangalitsa is a lardpig, with a high fat content in the meat; they are large and round. Because of the drop in demand for lard, the popularity of the breed has declined and they are now regarded as a rare breed.